MUMBAI (Reuters) - Since taking the helm of India's central bank, Raghuram Rajan's agenda to reform markets has put the noses of Mumbai bond traders firmly out of joint by upending practices that provided them with a relatively secure rate of return. Benchmark 10-year bond yields have risen more than half a percentage point since Rajan took office on September 4, as the Reserve Bank of India (RBI) has sharply restricted bond purchases and announced an unexpected shift in the focus of monetary policy to consumer inflation from wholesale prices. While the dealing community in India's financial capital concedes that Rajan's reforms are necessary for the longer term, many traders complain that he has gone too far too quickly, and without consulting the markets. Their gripes stand in contrast with the high-profile central bank chief's glowing global reputation as a capable technocrat who has been instrumental in guiding the rupee through its worst turmoil since India's balance of payments crisis in 1991. More efficient markets are a priority for the former International Monetary Fund chief economist, who has criticized distortions he believes unfairly benefit traders and banks. Early this month, for example, he cited a fiscal year-end practice by banks to dress up balance sheets by hoarding cash and holding back on lending, which distorts overnight rates. "We don't think the RBI should be in the business of bailing out the banking system with infusion of liquidity when the banking system itself is creating its own problems. And so we have to change the incentive structure," he said. The RBI did not have immediate further comment when asked to respond to this story. The pace of change has surprised traders accustomed to a central bank known for caution and for soliciting wide feedback before making decisions. And the reforms are not without risks for the RBI. Indian state banks can ill afford losses on their bond portfolios at a time when bad loans have risen and capital levels are under pressure. India also needs bond traders to shore up its finances. The 6 trillion rupees ($99.41 billion) in gross bond sales planned for the fiscal year that started this month would finance 85 percent of India's projected fiscal deficit. Traders warn the uncertainty could weaken demand for debt, especially since the RBI, which manages India's borrowing, is unlikely to pay high yields. "The fact is, you are pushing down 6 trillion rupees of government borrowing each year," said the chief executive of a primary dealership. "And all the market basically is saying is: look there is just so much appetite." Some bank traders complain they are being deprived of fair incentives after long being compelled to swallow huge amounts of government debt to help ease India's fiscal deficits and meet reserve requirements. "There is no doubt that these measures are good, but the only concern is these measures should have been taken in a stable market. And in India, the markets are neither stable nor mature (enough) to absorb these changes," said a senior treasury official at a foreign bank. "He has been doing things hurriedly without taking markets into confidence," said the official, who, along with nearly a dozen traders who spoke to Reuters for this article, did not want to go on the record in criticizing the central bank. But A. Prasanna, economist at ICICI Securities Primary Dealership Ltd, said discomfort over the reforms for some in the markets was to be expected. "Absent the changes which Rajan is carrying out, Indian interest rate markets will remain unsophisticated, shallow and narrow," he said. 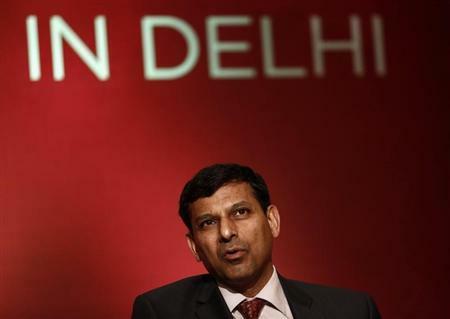 Within weeks of taking office on September 4, Rajan unexpectedly raised interest rates and has lifted them by three-quarters of a percentage point overall. That tightening has been driven in part by what some traders say was his sudden shift towards the much higher consumer price index (CPI) from wholesale prices as the RBI's main inflation indicator. "There hasn't been enough discussion and debate on the CPI," said the head of fixed income at a domestic bank. "I am surprised, because we're talking about an economy the size and scale of India." Rajan has been reluctant to conduct bond purchases through open market operations (OMOs), also riling traders. Although intended to help the RBI manage cash conditions, critics say OMOs enable traders to unload bonds at a profit in exchange for helping finance government spending by buying large amounts of debt. Under Rajan, the RBI has sold just 280 billion rupees in bonds through OMOs, bringing the total for the fiscal year ended in March to 730 billion rupees - half the 1.48 trillion rupees in the previous fiscal year. Instead, the RBI has injected 1.9 trillion rupees into the market via repurchase agreements (repos) with banks to shift to a more targeted system of providing short-term funds in an effort to help develop local money markets. With repos, traders pledge bonds with the RBI in exchange for cash loans, depriving them of the profit from a bond sale. The RBI is also considering scrapping a 14-year-old system under which roughly $30 billion worth of state debt is sold each year at a fixed spread over federal bonds for a market-based system that prices the debt according to risk perception. If implemented, some lenders could see mark-to-market losses of about 60 bps on their state bond portfolios, according to market estimates. RBI officials have also hinted they may reform the system under which banks must set aside part of their debt holdings until maturity, which enables them to park illiquid or loss-making bonds without marking them to market prices.